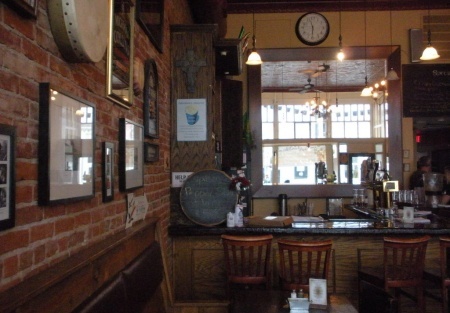 This authentic Irish Pub and Restaurant with a Type 47 full Liquor License has been under the same ownership for many years and is well known in the area. The Irish owner spent 1 1/2 years renovating to build out a beautiful, quaint Pub featuring over 1300 Sq Ft of total usable space including an outside Patio plus an 800 sq ft apartment above. The Rent is only $2,200 for the Pub, Patio and Apartment. You won't find a better deal anywhere! Around $1 per sq ft. You will have a nice business, a nice place to live and a nice lifestyle. The business is profitable and the possibilities are endless. Pubs have a draw all of their own and this one is no exception. Thia is a real Country Pub and you feel like you have just stepped back in time. This historic building stands proud with high visibility signage and is situated right on a main Hwy in the center of town. The whole ambiance of the place is real country and feels lReally comfortable. Pubs are well sort after, especially ones as good looking as this.The Kitchen is all stainless steel and tile and is open to the dining room. There are two walk in fridges, one beer the other food. The Patio is quaint and has an atmosphere all of it's own. Even the name of the place is so charming. So, if you want a piece of Lake County, California then take a long hard look at this place. When you step in you'll see exactly what I mean. The Lease will be brand new as the owner owns the building. Length of term is all negotiable at the time of purchase. There is a Type 47 full Liquor license which is an extremely valuable asset. Open seven days a week there is ample opportunity to expand the business with an enthusiastic hard working operator. There is nothing but upside and a great opportunity here . Only well qualified buyers with sound resources and many years of experience will be considered.